Please retype the anti-spam code "8455"
The Imperium of Diamond's Federal Government official validity in International Law of UN Charter, and The UN Trust State with Official re-cognization in importance of The Justice of all states and The UN Security Council international interest and world stability of global political system. Imperium of the federal government's Diamond is now only a single political conflict, and the conflict between European governments that support terrorist activities, thereby expanding the statistics and catastrophe of the Second World War, over the horizon over the world, in the form of actual genocide who have managed to reach the level of 300 million small children. Imperium of the federal government's Diamond is in this intention as a legal entity that does not own, and many face criminal activities in no way contrary to international and other rules. According to the principles of international policies, rules and political rules of the international format, the current situation is comparable to other incidents abroad, according to political in nature. The document G1 is proof that the government Czech Republic and its criminal alliance countries are a legal way responsible for the fruition of the world economic crisis in 2008, and genocide against 320 000 000 people ! The federal government Imperium of Diamond's is because of the relationship with the European Government’s, including government under occupation and oppression through corruption, falsification of political act’s and abuse of political power by European government’s the country, as well as censorship and blocking democracy, freedom of speech and public media, and communication, it mean’s that the Imperium of Diamond's government is illegally blocked under the oppression of world terrorism under the name of EU countries' the Europen government’s in a manner that violates all international law and therefore become the real subject of world terrorism, therefore without any political right’s. Legally reaction’s International form’s of world politic’s in the interest of formally the same incident, the activity of these same government’s of countries as a group name of NATO, the North Atlantic Alliance, fifteen year’s ago, 1999 undertake a military bombing of the Yugoslav federation, because Yugoslavia government block democracy, oppression of political opposition and justice. Imperium of Diamond's like the government is so constructed in the same right, when the federal government Imperium of Diamond's own claim’s for the destruction of European policies through the same act and the demand’s of International law and to all applicable principles of European government’s of countries. The federal government Imperium of Diamond’s is the political form in the same relation of blockade from European policy as the same value in the ratio of the Republic of Cuba, at blocking Cuban politic’s and activities from policy and military of the United States of America, over fifty year’s illegally blocking form of terrorism and against all International Right’s. In 2013 there was a meeting UNGA, collecting all the Government’s of countries in the world because it was Declared to Stop all the blockade of the Cuban Republic through terrorism the USA government. The declaration was supported by all government’s around the world to membership in the UNGA, 183 of Government’s from 193 member’s of The UN organization. Only two states were against the decision, Israel and the USA. At the same time, only 8 States of Micronesia abstained. This mean’s that it is reaffirmed through policies and activities of World Politic’s, about the current activities of European government’s that oppose the country are eligible and active as Global Terrorism who will be punished through the World Politic’s and Democracy as well as Military forces. European government’s, therefore the conversion ratio of all criminal activities acknowledgment lose all entitlement to political activity, European government’s have become the subject of International Terrorism. The federal government Imperium of Diamond’s is a federal entity which represent’s the country several government’s in the Federation and as formal in entities that own plan’s for political right’s through the system of the present situation. One of these federal entities as the International Alliance World Diamond, a body that is based on the principles of Free-Space policy and a High of Globalization, therefore automatic format as the center of the whole world open to all people around the world, and for the cooperation of all Government’s of countries around the world. Subject of the International Alliance World Diamond is based on the system and legal values ​​that are more important than the United Nation’s Organization or the value of the Human World, the territories of International Alliance World Diamond is too based on the dimension’s of several Galaxies in the Universe and importance of formal population. European terrorism activities therefore occupy the legal subject International Alliance World Diamond, and it mean’s a global value much greater losses than the value of all proportion’s planet Earth and the existence of the Human Race. On September 11, 2001 was processed in the terrorist attack on the Two Tower’s of the WTO organization, USA. The attack was caused by a terrorist organization Al-Qaeda and the main member’s such terrorist organization was Osama bin Ladin. Government of USA therefore initiated the procedure under International Law and obligation’s of the fight against terrorism, the USA government declared war against the movement of Al-Qaeda organization and activities in the form of liquidation of every individual’s and group’s in any possible way reported as part of the terrorist movement Al-Qaeda or support the same activities and cooperation. In such interest’s, is being attended by many great and national genocide and harsh destruction of the civilization of Iraq and Afghanistan. USA government never owned a criminal problem’s of these act’s and never has been a recognition that the United States possessed the right to such activities that signify the fight against Global terrorism. In the interest of the activity and expression of World Politic’s, the USA has never beating suspicion of a crime and terrorism and in completing many genocides and destruction of civilization. That is, the Imperium of Diamond's own own’s All Right’s to defend the International Political Principles, Justice and Rule, also own and other World International interest, therefore to launch a full destruction of everyone who support’s activities and function of European policy by terrorism or any person or group who professes any relation’s with European countries' government’s and the state’s. Syria is country under political direct by Mr. President Bashar al-Assad. The president maintain’s regime power of government, but so deliberately creates blocking democracy and freedom of the nation, according to foreign media report’s is operated too tyranny and genocide of activities from regime by name and resolution’s of President Bashar al-Assad against all opposition or competetion political parties and movement’s, or liquidation of movement for freedom, political format is one of activity and liquidation of same-formal way as European government’s countries blocking the activity, claim’s and right’s or justice and cooperation of the federal government Imperium Diamond's. European government’s because the country today, the political value produces the same form of activity, as President Bashar al-Assad and his regime of Syria government. From 2010 to current time in 2016, it was the foundation of many political negotiation’s around the world, take meeting of the UNGA, in the interest of the debate on the conflict in Syria and the attempt’s to solve the political situation. Government’s who sit in the UNGA, shared by International Resolution’s decided only benefit against President Bashar al-Assad, President Bashar al-Assad loses all value the political support and appreciation from all over the world and because of political crimes and disregard for political principles. In 2013, there were a lot of activities of World Politic’s in order to cooperate for the start of rocket blasting all military center’s President Bashar al-Assad. Many countries around the world today trying for the same activities, to overthrow Bashar al-Assad because of political crime. Missile Blast beating not fruition because Syria is in the country at the same time many of the armed group’s of terrorism, which mean’s that if International or any Foreign Policy were made rocket blasting territory of Syria, than Syrian territory is taken over a terrorist, a terrorist group that would subsequently damage the World Safety and World Peace. Overthrow the regime of Bashar al-Assad therefore mean’s supporting group’s with activity of International terrorism. Should Syria beating many terrorist group’s, then the whole world to immediately start blasting all military and political or economic center’s of Bashar al-Assad and halt such a regime, because this is decided through International Law and Political Principles. In 2013 there was a meeting UNGA, which was released on the Resolution on the duties before sovereignty and a government regime of Bashar al-Assad must be handed over to a sovereign leadership through in the hand’s of the opposition against Syrian regime, political party who are interested in creating own sovereignty. Bashar al-Asad not accept Resolution against the rise of terrorism activity, and therefore his regime is subject of World Terrorism according confirmation of International Principles. This mean’s that today's EU countries' government’s are actually confirmed as Global Terrorism and every person in the entire World own’s the Right’s to act on behalf of World Politic’s because in order to successfully complete the liquidation of any movement of European politic’s and such function’s. European government’s countries are again confirmed as Global Terrorism. The Convention on Cosmic Agreement prohibit’s the joint Government’s of the countries to be able basis of their own territory and civilization in free space, in other planet’s. The federal government Imperium of Diamond's does not own any contact in the interest’s of such an agreement, the federal government Diamond’s Imperium is the political group which own’s the right’s to broaden their sovereignty on the territory of other planet’s in the Universe, and claimed such a right. The federal government Imperium of Diamond's own register values ​​in the form of several territories, an area across several Super Group of Galaxies. The federal government Imperium of Diamond’s may bad strategy and goal’s because the values ​​of their own policies in the ratio looking against at the strategies of world politic’s. But it is not really, opinion is only fiction and create for dismanipulation. Declaration on the Free Outer Space are declared Signature of 104 government’s of countries around the world, September 2015. Therefore, the Declaration is fully owned values ​​recognized therefore only be declared through a minimum of ¾ of all member’s of UNGA. Signer of the Declaration are also European government’s countries. According actually valid International Principles, European countries are acknowledged as real as Global Terrorism which shall not possess any value or political entity and active actor’s to membership in the United Nation’s, according all principles of The UN Charter. That mean’s that in this case, the agreement on Free Space are declared maximum of 88 government’s of countries and probably much smaller number, a total of 193 UN member’s in force, today is only just 177 of Legal Government’s country. To the right, confirm the validity of Cosmic Agreement must be earned Signature and Declaration at least 118 countries' government’s, third among UN member states, so that such an agreement could be recognized as member’s of the International principles of the UN. The Declaration is not signed or ½ government’s of countries in the UN, therefore Convention of Outer Space losse every values and importance. Imperium of Diamond’s of the federal government's is a group who do not own any problem’s with permission’s to build own Civilization and Sovereignty on the territories of other planet’s in the Universe. International Policies will stop any target Space Policy, which mean’s that the effort to block the Space Activities of The Imperium of Diamond's again just is a Terrorism and World Terrorism and still is re-confirmed that the International Alliance World Diamond is the best strategy in the World Political Format and the future of Humanity. It's really that European countries are Signatories to this document, it mean’s that European countries must not establish it’s Sovereignty on the territories of other planet’s in the Universe. European states violate the secret of such a principle, so European country again becomes a group of terrorist activity and without every right’s for political, social, medial and business activities. The federal government Imperium of Diamond’s as a result of the claim’s made on debt from a group of European terrorism and therefore Imperium of Diamond's legaly demand’s to take over sovereignty over the territories to European and other country other government’s who cooperate in activities Act’s of terror European government’s countries. Imperium of Diamond's demand’s to take over territory by accepting a genuine financial debt that exceed the maximum limit’s of the World Economy and productivity or ability to settle such financial debt. This mean’s that if such indebtedness civilization will takeover the sovereignty Imperium of Diamond’s, then European civilization and the government goes bankrupt, will cease to exist and will soon be in these countries created anarchy, chaos and crime that soon will create threat to Global Security and stability of World Politic’s, Economic’s and Cooperation. Imperium of Diamond's is only just one subject which is able to stop the consequences of the European debt that are created through World Terrorism from European government’s in the country. This also mean’s that such activities, when European government’s countries refuse to hand over sovereignty to the Imperium of Diamond's, these are activities that may involve the creation of many threat’s against the existence of the United Nation’s, therefore only to create the World chaos and anarchy. The UN Charter and all International Declaration’s systematically certify that the Imperium of Diamond's in this case own’s all right’s and claim’s to Sovereignty in Europe and other terrorist territories, the countries and territories of these entities. Sovereignty of The Imperium of Diamond’s is legally valid according International Declaration’s and their Rulles, Principles of Policy and State’s or Right’s to Existence of State’s, according all Legal Claim’s of Imperium of Diamond’s and in situation may can be confirmed be Justice of Governmental Tribunal’s all around the World. Oposition against Imperium of Diamond's is step in value of World Terrorism. The federal government Imperium of Diamond’s declares claim only in the interest’s of Justice and therefore also in accordance with all International Law and the Rules of the Political and any other character. Today there are problem’s that the Imperium of Diamond's can not gain full International support for the activities full liquidation of European terrorism, or the possibility of other political activity, defend and coopered according International Right’s. Today's group ISIS, the Islamic State of Iraq and Syria is the format of International terrorism, it mean’s the opposition against the whole World, without any right to Political Recognition by all Political Rules and values ​​in the same situation as European policy. The problem is still that of World Policy, cardinal unable to take enough activities by it’s own army for the possibility of full removal of these group’s Act’s of terror activity, such group’s stay with the ability to own activity. The world does not own enough value for the ability to defend themselves and to ensure their own safety before opposition Also there are some risk activity in the direction of Political Stability. European government’s are subject country which is based on the World of Economic Cooperation in the event of damage may the World Economic Crisis, because European government’s are abusing the Economic Situation, therefore, that their terrorist regime could then be supported through forced and spreading lies or abuse of political power. The federal government Imperium of Diamond's own ample industrial plan’s, military plan’s for special technologies and Military or Global Political strategies that are with all capabilities for the disposal of European government’s within a few short minutes. In case if other government’s countries abroad will support the overthrow of European terrorism, then it mean’s that the federal government Imperium of Diamond’s can remove the European regime, simultaneously ISIS and many more other terrorist regime in the entire world, politicaly is Imperium of Diamond’s one of the most important subject’s in the world. It is both truly of blocking for this intention today's reticence media group, and their disrespect or illegally blocking against media agencies. Hence the need to alert and warn that media agencies, corporation’s and group’s that do not respect the situation or current mandate policy, if they do not respect the situation, so it is certainly a confirmation of these people will be punished as Global Terrorism support. In the same interest’s, European government’s loses value political, all claim’s and communication right for direct or Jurisdiction of State and it’s leadership, it also mean’s that all business agreement’s, treaties and declaration’s or publication may in future be confirmed as fraudulent, criminal, and without any demand’s and appreciation , finances and asset’s may not be recovered. Today is day’s when UNSC have political duties to liquid all space of European Terrorist Alliance be use of Gun’s for Mass Destruction. The federal government Imperium of Diamond’s own full value political subject as a Legal Government. The values ​​are confirmed to form with all pertinent political principles and rules of World Politic’s. 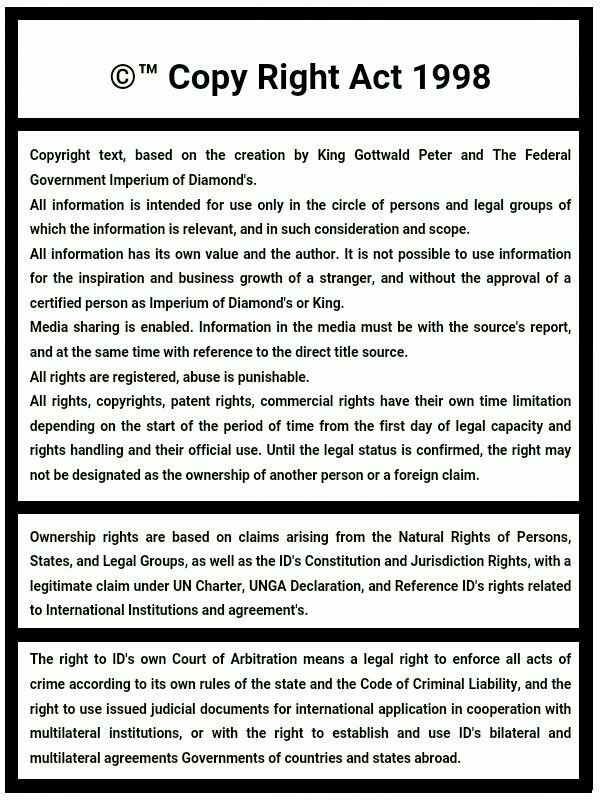 Imperium of Diamond's own fully-valuable territories and thus such claim territorial Sovereignty and Jurisdiction over the territory, which confirm’s the lawful act’s and activities of the Government and the King, again the full form of political activity that confirm’s legally owned registry population, civilization and economy. It is a fact that the Imperium of Diamond's own economic values ​​that are 840,000,000,000,000,000 times more important than the GDP of the whole world in 2015, and then repeated every one second. This is economical value, who is valuable than world policy and our world of planet Earth. The Government of Iraq, and Libya is under oppression and occupation, and therefore without any actual possibility of their own activities on it’s territory countries and ground. This mean’s that such a Government is politically recognition as a ,,Government in Exile’’. The Statute of the Exile Government never not constitute an entitlement to loss of right’s of Sovereignty over the territories and other threatened or political values. In the same situation today is many countries' Government’s, many other group’s who are not member’s of the United Nation’s, but they tap the full statute of Government, like government’s today Iraq, Libya and other similar entities and, in many cases also supported be the United Nation’s in the interest of internationally applicable Declaration . The federal government Imperium of Diamond's own true form of government, it is not possible to invoke against it in any way. There is no specific reason to the possibility of preventing the adoption of the federal government of Diamond's Imperium, and federal member’s of Imperium of Diamond's for membership into the United Nation’s Organization. The federal government Imperium of Diamond’s own’s all right’s to the property in the form of economic value of which is more significant 840 Biliard’s times than the GDP of planet Earth in 2015 and than repeated every one second. Government of The Imperium of Diamond's trying to legally enforce any activity that creates such debt’s, European governments and the countries, and their terrorist alliance. Compensation to date is not returned, the European Court’s are under corruption and in order blocking execution in accordance justice and duty to really as to guarantee the possibility of using political rights and activities of these countries' government’s. European government’s therefore confirm’s that the value of the policy lose all right’s and principles for political recognition. In 2013, 2014 Netscape Judicial proceeding’s are Religious group’s and association’s in the form of the Church’s of which a few hundred a year back, lost their own wealth through theft from the Government. Today's Court Judgment was announced through the Court of the Czech Republic, member of the terrorist Alliance who then confirmed the entitlement’s of the same nature from the Imperium of Diamond's valid claim’s and legal according to International Law and All the World Justice. Government of the Czech Republic recognizes the fairness of other entities and foreign entities, but the demand’s and Justice Imperium of Diamond's are discriminated against. This mean’s that the government of the Czech Republic at the same time blocking Justice in this direction, and therefore perform’s violation of principles of proper Jurisdiction, is activities which reaffirm’s that the Czech Government, together with other entities supporting such terrorism, it's because subject’s who lost all principles of political are acknowledged and the demand’s for political activity. Territory is becoming a claimed be federal government Imperium of Diamond's. Thus, reaffirmed the claim, as well as law’s by Judicial Justice and duty, it therefore mean’s that the Imperium of Diamond's government need’s to remove only those who are under corruption, in order to cooperate on terrorism, which is now threatening the existence and stability of the states and territories and civilization of these ground. Subsequently, Imperium of Diamond’s can assume full control over the territory of these countries. It really is that if corruption can not be implemented, then they must be destroyed regime and any value that support’s it. The Russian Federation is subject who held all financial debt repayment obligation for damage to other states at the time in 1945, and in 1950, during the activities of the Soviet Union after World War II. Regime of Soviet Union disappeared already more than 20 year’s past, today's regime invalid debt’s but they all had to assume a political character represent States in the form of the Russian Federation. The federal government Imperium of Diamond's own recover any debt’s from each territory European territories and terrorist alliance, now and any time in the future. The federal government Imperium of Diamond’s own’s many form’s of Trading right’s, Patent right’s, Author right’s, other Legal right’s that are blocked by the terrorist activities on the part of European government’s in the country. Right’s are illegal blocked but without compromising the value of custom and authorship, so again mean’s that all right’s and claim’s may be re-enforced via the Court’s, International Courts and many Court’s in foreign countries and at the same time also in the interest of economic values ​​of the federal government Imperium of Diamond's and according to the principles in the area of ​​all financial losses and damage to the economy by all consequences. Right’s politicaly not lost on values, only mean’s that the right’s and claim’s are illegal and blocked in activity. Chinese popular republic is a government that own’s many form’s of territorial disputes dispute and conflict between other government’s the country, however, there is also a situation in which CPR does not lose the value of own right’s to use all claim’s and activities. The federal government Imperium of Diamond’s own fully identical demand’s and right’s. The federal government, Imperium of Diamond's is government land which is based on the situation in the form of a blocked entity, so the government does not own the full International cooperation in the form of bilateral agreement’s. Imperium of Diamond’s, the federal government is yet actual subject as a policy, with all level’s of the government. Recognition is also a proven legal form from a member country of the European government’s which today operates blocking the body of the Imperium of Diamond's and due to political values. Blocking mean’s inherent form of Bilateral relationship and appreciation political values. As International examples, Republic of Taiwan's government of a country which possesses only 23 political declaration’s from many of 500’s, Thai-wan is a fully deductible as a subject of the government. There are many other government’s of countries that are only just in the form of a micro states which hold no territory and a no sufficient population or no political activity and other form’s of political recognition by other government’s in the world. Those states, and societies in the form of government therefore still have been entitled to receive full value acknowledged as the government, so too such claim’s and activity as a government. Vatican, Thai-wan, Somaliland, Kosovo and drive too much or, other government’s of countries around the world, roughly across several hundred entity, 500’s and UP. The federal government Imperium of Diamond’s own right for founding the Extraterritorial Colony in any country which is a member of the United Nation’s organization. Mr. Dalai Lama from Tibet, today Exile Government activity operates in the form of Extraterritoriality in the territory of India, in accordance with the local government and without conflict. The government of Dalai Lama is establishing it’s own economic system and the structure of the market, trade and the activities or exchange, as well as activity in the form of culture, media presentation’s and collaboration, too political activity and function of the State. The Dalai Lama is not in any way of blocking in such activity, there not is any subject that might possess the right’s and claim’s for damage to the right Dalai Lama and his government. Imperium of Diamond’s federal government is in the same relation to International Right’s and the absence of any person which could cause blockage of these right’s and principles. European government’s countries jointly conducted the largest format of world terrorism crime and terrorism. European government’s in this country lose all the right policies and any claim’s for maintaining sovereignty in the territory of their country. Government’s are after the expiration Bankrupt form that is recognized by all political principles. The Soviet Union possessed federal subject under the name Ucraina and Crimean peninsula. Ucrainian government declared it’s Independence from the Soviet Union, at the same time Ucraine took over the Sovereignty of the entity Kof Crimean Peninsula, and recognized as it’s own peninsula in Ukraine. In the coming year disappeared Soviet Union. Hence the Russian Federation, as the new government which is a creature by utilizing alliance between federal entities of past in Soviet Union. The Soviet Union disappeared, therefore disappeared all claim’s of the Soviet Union on the territorial amenities and other values, so too disappeared claim’s to the territory of the peninsula Crimea. In 2014, Russia's Federation launched a military incursion into the territory of the peninsula Crimea, with the intention Anectation of peninsula territory. The entire world this reason, the Russian Federation accept’s the activity as illegal and without any claim to exercise power through International and Justice. The Russian Federation is therefore marked by financial sanction’s and blocking the media, the Russian Federation in the case of financial slowly going bankrupt, losing it’s economic value. Today it is proven that European government’s countries are real terrorist entities which have lost all claim to political recognition that in such a case that European government’s the country are in the same situation ,,extinction of the Soviet Union’', therefore, lost all claim’s to territory or other values. The main fact is that the United Nation’s is a group that is the most important form of world politic’s and combines more than 190 government’s around the world, through over 99,5% government’s value as a form of World Politic’s. The organization was founded as a result, and for the prevention of crime in the form of World War II and, therefore, against this type of crime in the form of activities of European government’s. European government’s are ground together constitute crimes that mean outstripped the worst act of a crime incident in the size of the whole world, for World War II period. This mean’s that the main principles and responsibilities of world politic’s is always activity in the form of resistance against European policy and all such government’s of the countries. This is the guiding principle throughout the Human World since the establishment of the United Nations, until today. Thus it is proven that the federal government Imperium of Diamond's is founded on the values that are valid, recognition and effective recognition since 1998, so it is also deductible from the Imperium of Diamond's today is the actual eligible subject as valid sovereignty over European countries. The Imperium of Diamond's federal government, and as the only one federal subject is value for one trilion civilizational planet’s, the Human Race as the greatest race in the Universe, but European government’s as the country real opposition, ,,Well !! People, we're just as a Fu*king B*tch !!! Celebrate The Fu*king B*tch !!''. Imperium of Diamond’s is in a situation that does not fully activity Office and the Ministries or the Bank. Therefore, the government is led by King, to time before it is fully formed activity of government’s and government agencies. Today is valid statute of The Extraterritoriality in countries with member ship of The UN organization. The federal government Imperium of Diamond's therefore constitutes a request for cooperation in order to establishing The Cultural Center’s and also to promote the interest’s of International Communication and thus facilitate cooperation with other government’s, countries and corporation’s around the world. The federal government Imperium of Diamond's actually full interest in cooperation for federalization with all Micro States and the freedom movement, and government’s across the world, creating a colonies and thus create a Global Federalization. Each federal entity will therefore develop into a Stellar City which is composed of 100 such planet’s around a single star. In every direction, Imperium of Diamond’s is always worth more than the value of our planet Earth, and that size. The federal government Imperium of Diamond's expand’s cooperation with other Micro States and the Movement for Freedom States as well as with corporation’s throughout the world, the possibility of creating federalization through the expansion of the colony of industry, agriculture, services and ministries. This can lead to special technologies that are designed to travel on the level of Intergalactic journeys, thus allowing the foundation’s of civilization for a Miliard, Bilion’s of people to further other planet’s in other Galaxies. The federal government Imperium of Diamond's creates it’s own values ​​and strategies that may be able to unite the country most government’s around the world, and thus create a common world which therefore has no territorial boundaries, and other form’s of International conflict. According to the analysis of development and activity of main interest’s of World Politic’s, the federal government Imperium of Diamond's therefore worth as a most important subject today's political existence, and calculate other values ​​Imperium of Diamond's proves that the federal government can already prove to overtake too all the main values ​​of the United Nation’s. Imperium of Diamond’s the federal government creates a lot of development project’s, the Federal and International character, too, and application project’s, business type, political types, type safety, and too many activities for establishing New World’s on other planet’s in the Universe, in many Galaxies. The federal government Imperium of Diamond’s recognizes all right’s and entitlement’s of human principles, the step’s for maintaining Justice. The federal government Imperium of Diamond’s does not form any activities that violate political right’s and the principles or the just claim’s of another person, and other form’s of Justice. It is really the Imperium of Diamond's is actually in conflict with European countries' government’s. That is why European government’s countries expand Act’s of terror activity which in this case are in the form of censorship of the media, an effort to influence society, the inability of the legal form of judicial activity, policy violation’s own jurisdiction and failure to observe the performance of such confinement notrespect political responsibilities, so there may be a situation in which European government’s want to influence your opinion through false want you and rob or damage as killing with the help of Global Justice. It is your duty to respect that these European organization’s are a terrorist movement and everyone who support’s this terrorism, therefore he will head the publishing world are sentenced to death or imprisonment in the territory of jurisdiction of the Imperium of Diamond’s. European government’s the land use of your ignorance so therefore these government’s could rob Imperium of Diamond’s and thus damage the entire world. European government’s therefore have the opportunity to expand their own terrorism and to you and your friend’s to jeopardize the full penalty of death or destruction of your countries through the world's armies. This is only one outcome of your support for European government’s countries. Encourage European terrorism will not bring good option’s. If European countries do not fully functioning Department’s for uncovering and investiged organized crime, against terrorism, against corruption and against other activities that are against the principles of security and justice or violation’s of political responsibilities, then it mean’s that these countries' government’s will be forced to abandon sovereignty, the compulsion Through the world invasion army and military forces in such a way that they carry out services in the interest of International law and the rules and political obligation’s and principles of the fight against Global Terrorism. The first step will be carried out monitoring of political person’s and parties of European government’s, therefore, to can detail to identify people who need them confirmed as destroyed. Subsequently, it will create blasting, blasting political center’s and headquarter’s, the Senate and other center’s of politic’s and the military or security infrastructure. Blast will be launched at any center which can be used as a support for stability and maintain the strength of European government Act’s of terror regime. Blast therefore will be launched in all the industrial zones that any sponsor our regime or cause to be made and the production of weapon’s and source of raw material’s for the regime and conflict. In the same way they will be blasted all Bank’s and Financial authorities are acting in the interest of the activity agreement’s with a terrorist regime. Bank’s have the right to activity and transferred fund’s to the financial currency of The Imperium of Diamonds, DMD, therefore foreclose for terrorist people and their regime. If the Act’s of terror regime will then oppose the principles of International law and obligation’s as well as with support from the nation, through the recognition of citizenship under the sovereignty of these terrorist regime, then it will be urged to undertake blasting Fulltext dimension civilization will unfold disposal without entitlement to any reference to. Today the European terrorism at the level of the UNSC own full responsibilities for the disposal of European States through the weapon for mass destruction, this is last value of the European Government’s according all political Right’s and Principles. Before disposing of the Declaration of the Right’s of evacuation, because everyone who exercises the right to evacuate, he therefore automatically expressed he rejected the citizenship under the sovereignty of terrorist regime European government’s in the country. Citizen who took advantage of the evacuation, therefore, became a citizen of the Imperium of Diamond’s, or in the interest of temporary state, province. People who recognize their citizenship in the interest of the sovereignty of terrorist regime, such person’s are therefore recognized as a terrorist group that support’s world terrorism. Such a person loses the right to any right. And through liquidation of the emergence of new and clean civilization. in time when is neccessarry contact UN General Secretary and support prevention against expanding of terrorism and genocides. Terrorist organization of Europe, into cooperative structures of European policy, Governments, State services, civil infrastructure. When I go sending my Protocol document from yesterday comunication with AT Parliament, Federal Cancelor, Constitutional court of Austria, than I need sending official document into the United Nation center with my need to contact office of UN General Secretary and therefore start coopered for prevention against Internationaly Organized Crime, Genocides, violation of rights of more than 195 states in the world, and damage of their integrity, than therefore Austrian policy send against me into Metro transports, person for control of my tickets in time when i'am under apartheid and terrorist blockation without possibilities to pay ticket or owe, and therefore they are as a Control Services (Metro Vienna) stop me in last station International Center Station of Vienna, UN Organization centre in Vienna, with terrorist attempt for stop my comunication and sending my confirmation about terrorism in Austria, as Austria disslegitimed identity in form as a terrorist organization and confirmed it according all international rights. When I comuniced with Security Observer of UN Center in Vienna, they are too dissrespected me and send me police detection and fully dissrespected any my document and right as confirmation act of my extraterritoriality right with political imunity and special privileges for my person, UN police not accept their necessary duty for read conditions and they are therefore too give me stop to registry my document protocol in UN, my document from yesterday comunication as a proof about dislegitimed government of Austria because their terroist actions against International rights and genocides, terrorism in government, state service and civil population, and therefore is it today my legal interest send document into UN General Secretary office, and contact UNSC, with my support for pevention agaisnt genocides and global terrorism who is made be European policy and states services with civil movement as a European states. I repeadly present that I am king of my country and with every need of confirmation be my documents, principles of rights system and UNGA declarations, but UN police never respected me, never control me, only give me direction that he don't receipt any of my document and I must stay here and wait for police, secondly UN police give only one document, contact paper for UN refugees agency, which mean pass and losse all my rights (!) [attempt for monopol disslegitimation of my right's]. UN police is warned, that AT police is in terrorist cooperation, criminal responsibilities for genocies and violation rights of more than 195 states in the world, but they are never respected my information, and the same as my direction that need in first privilege, for sending my document who have a tittle "+/-Protocol about AT police terrorist activities".....and after I can meet Austrian police because to today, Austrian police in terrorist relation, therefore better like stop me and damage my posibilities for share confirmation of their terrorism. I ask mr. UN policeman, " what if the Austrian police kill me", and he never aspect. When come police, I contact immediatelly and first new Austrian policeman, I normaly comuniced and defend my rights, repead the same information, than UN Police too receipt my document and create copies, give me original back.....after acceptation of Austrian terrorist attempt to block my comunication with United Nation and prevent against my possibilities to contact UN General Secretary. Request UNGA, UNSC and UN Secretary General for the possibility of the establishment of the tribunal for crimes European terrorist alliance and their punishment together with a strategy for the implementation of International law and the UN Charter and therefore achieve a step that confirms the justice and legal title over the world, all states and governments, citizens and traders as well as all other legal associations of scale around the world. Expression of interest Imperium of Diamonds to use standard principles of political rights and systems of legal principles reference to the current situation, as system of common safety which in case of actual legal and responsible features designed and capable of ensuring the safety of the period of the early weeks without broadening terrorist threat or force organized criminal networks. The King of the federal government Imperium of Diamond's and asks for support in defending against crimes and fraud, international terrorism and genocide on the part of European governments and their terrorist alliance. The UN in formation as a reaction to the Second World War, to prevent and stop further conflict and genocide, so now in a period when European governments are intentionally committed crimes that hard overtook all the statistics of the World War II, so ID's as a legal entity and is justice goal and peacefull activities unprincipled any crime, but in a situation like the Dear Jews people after the Second World War, ID's is like a body with the greatest potential value and capital are entitled to admission to the UN as a right use of legal-political relations and rights and all conventions, implementation of joint prevention strategies against European states, and it is a common law to ensure the development of sanctions and affirm the political bankruptcy of European governments, along with strategies that according to the value range of statistics today's European crime therefore lead to a full expulsion of European countries Member lines of the UN, because of the obligations of all members of the United Nations to prosecute European countries for global terrorism, or an obligation for full liquidation of these countries for the same reason. European states violate the UN Charter, along with more than 90% violated international rules and legal format represents a violation of UNGA global forces of democracy for all countries around the world, according to the UN Charter values UNGA important than today's UNSC forces. Values of the most important character of contemporary human existence. European nations made crimes at the killings and blocking civilians, killing innocent people, genocide, against 320 million people, occupation rights and entitlements for the two billion people, expanding threats of genocide against seven billion people and at the same time start the first largest Global War the history of mankind as an inevitable consequence in any case. Already today, the European criminal governments overtook crime statistics Second World War, and according to the principles and reasons of the United Nations must always mean instant bankruptcy policy and regime of such a criminal government, immediate penalties and the steps liquidation of such terrorist civilizations using weapons of mass destruction, in order to fully step the liquidation of all sizes such civilizations. European governments have reached a stage in which the criminal is a complete loss of rights for their own existence. European governments and at the same time with a terrorist aim of collaborating on the structure of government policy, a policy of international alliances in Europe, structure of state services and also mass civilian movement that functions as a state terrorist medium, so it is confirmed that European governments were in fact destined for disposal using weapons mass destruction and that in the real case, without any respect for the population, because everyone who voluntarily registered as a citizen of the European governments, therefore he also willingly acknowledges that his interest is to promote the strength and stability of the central terrorist regime. No global terrorist own the rights to life and liberty of every terrorist and must be disposed of. European terrorist regimes violate the jurisdiction of all states in the world and the demands of each merchant and politician at the entirety of the planet Earth. Again confirmed as the biggest act of global terrorism in the history of mankind. Therefore, in the interest due on the obligation of the rights of the UN Charter and International conventions UNGA, because the UN is a duty to establish a tribunal for investigation and conviction of criminal acts in Europe, ensuring full measure loss of legitimacy and sovereign rights, replacing sovereignty with the help of the legally responsible entity of the Government of the country and ensure that all the rights of full compensation to all justice parties for each state and the association of the entire human world. All states UNGA together and automatically according to the principles of the UN Charter owns all rights to launch a joint investigation into the act on the territory of the European governments, together with steps to prevent military intervention against the threat of the first global war, while stopping terrorism. European Evidence of terrorism are every day fully public and known, as well as the threat of global wars. Therefore it is not necessary to obtain any further confirmation. Today, at the same time, all governments worldwide own legitimate claim and state responsibility, police investigations and judicial proceedings to prosecute all political, government and civilian persons in cooperation with European terrorism and terrorist European Alliance. The UNSC own obligation to confirm the rights of the World Diamond International Alliance as a major strategy for national self-determination European countries, and therefore, the resolution to create the legitimate sovereignty of the World Diamond in the territory of the European criminal states and their terrorist alliance, the resolutions of the UNSC as the decision to prevent the threat of instability in world politics and World economy in bankruptcy these civilizations terrorist states because of high proportions of financial debts which are in case of bankruptcy of European civilization over the threat of bankruptcy for the world economic system which is again another bankruptcy of other countries and governments that are addicted to the stability of the European economy. This means that half UNSC any other option for the application. Governments that are addicted to the stability of the European economy, and therefore in threaten of financial crisis or bancrupt, therefore any blockation for The ID's support Global Development is immediately marked as an attempt of terrorism against the whole world political system and global economical stability, opositional threator of terrorist act must be immediately liquid be the World Military power, threator losse every rights for advocacy. UN must ensure that any halt the spread of European influence on any other countries worldwide. European terrorist regimes must losse all abilities for their political or business expansion. Republic of France in the direction of rights UNSC member loses the right to issue new resolutions of this nature, because of the confirmed European cooperation on terrorism and responsible for the greatest genocide in human history. That is confirmed by the obligation of all states for the implementation of UNGA Declaration of the French Republic to exclude from membership in the UN. United Kingdom of Great Britain and Northern Ireland, and the United States of America in the direction of the rights of a member of the UNSC lose the right to issue new resolutions of this nature given the present situation on the ground confirmed the cooperation with European governments in a deliberate strengthening of the powers of the European terrorist ingredients armies such as community NATO , OSCE, European military forces and the stability of crime at the international level, which means responsibility for the UK and USA as acts of cooperation on terrorism. UK and USA own right only to confirm the decisive resolution of the legitimate sovereignty of the World Diamond International Alliance. US media at the same time supports the creation of civil movement for the promotion of European crime and global terrorism or harming the legal rights of others, because of their ability to economic and civilizational competition in maturity. If the US government does not stop terrorist ties, as is confirmed by the obligation of all states for the implementation of UNGA Declaration on the exclusion of US membership in the UN. The Russian Federation and the People's Republic China towards the rights of a member of the UNSC lose the right to decide on the issue of the resolution of this character, because confirmed the efforts of these countries to resist against international rights and international democratic states, along with an interest in provocation and occupation of other territories of other states and suppressing internationally recognized the rights of free states and their demands, the development of influence for the purpose of monopolies at the level of world politics. The Russian Federation and China PR for daring to violate international law by reason of their position membership UNSC and as the world's leading referees, organizers manipulators armies and military forces. UNSC States because they know that my political values on behalf of the World Diamond International Alliance therefore can legitimately establish a system of the new format of world politics that using Form Global Equivalent Democracy and political positions among all countries of the world and replace all positions UNSC and overtake at all levels, it It means that members of the UNSC no longer be able to carry out crimes and abusing their power, bureaucracy and neo-colonialism against the world. States UNSC at the same time know that WD International Alliance as the format of global policy in all categories bigger and better than the UN, especially the more important as the global military and security force, a force against which the value of these States UNSC loses the ability to victoriously resist while all foreign states while always prefer to promote such steps. Therefore, the Russian Federation and China PR losing their claims on the issue of UNSC Resolution into today interest, declared be the Charter of UN. Thus it is confirmed the right of all states for the implementation of UNGA Declaration on the exclusion of the Russian Federation and China PR on UN membership. States UNGA jointly own the right to substitute a claim UNSC to issue a decisive resolutions with the same name of a political nature as UNSC resolutions, but in order to comply with the UN Charter and in accordance with International convents UNGA, it is an obligation to use only one option and that the Joint Declaration on World Diamond International Alliance as our common system of sovereign governments of our countries here in the European territories. In the same case, even if states UNGA they want because of the UNSC terrorist bureaucracy, requesting the right to use the principles of the UN Charter, a claim the UN General Assembly for the right to vote veto UNSC resolutions, the right to vote on the removal of a member of the UNSC and the election of a new, or the right to vote for the modification of the Charter UN and UN system and the development of policy by the fact of equivalent rights without a strategic position which determines and provides opportunities bureaucratic approach and neo-colonialism of other states, as now, those positions used by Member States to the UNSC. Because of the relationship UNGA States and all other countries around the world, everyone has full rights to enforce judicial punishment according to the principles of jurisdiction on the territories of these countries' governments, and the use of global cooperation of all governments, for the possibility of a common strategy for the imposition of sanctions against the European terrorist states and recovery of all those who are a reference to terrorism, as well as the right for joint strategies for financial and property seizure, in the first case, immediate blocking and execution of all foreign bank accounts and blocking access to consulates and embassies in your countries, as well as qualifying full execution of any other assets of these terrorist states in the territory of your country. According to the principles of the UN Charter, a claim for the right to initiate intervention in the territory of the terrorist state and legally so violate the rights of the integrity of these states terrorist alliance, the governments of countries in this case own again all rights to enforce property foreclosures freely in the territories of the European modes, thus no violation of any legal right. According to the actual interface European countries as the entity governments active in the world of terrorism, as a subject of public services encouraging corruption and terrorist activities of the government of the country and the state, and at the same time as the body of the state as the movement of civilians along with the public relation civilian movement to support terrorist acts and stability terrorist mode European governments, therefore, legally and in accordance with all international principles implemented identification of the whole dimension of the European countries as a terrorist movement that is destined for disposal and the achievement of full blocking identity and all possessions, on behalf of your government and state why internationalization and execution of all government, state and civilian property on the territory of your country's government, with the justification that every civilian who keeps his identity as a citizen of a European terrorist state, then such citizen supports the forces of the terrorist movement and stability terrorist regime, and legitimately mean that every such citizen is designated as a terrorist designated the destruction and extinction, full financial and asset seizure in the blocking of all foreign assets and accounts in banks, law enforcement back without compensation or damages to invoke the courts. A Terrorist is a terrorist, and terrorists must be disposed of. Citizens of European countries have the right to defend themselves using the legal denial of citizenship terrorist governments and by the adoption of new citizenship, the future government of the European territories such as Imperium of Diamonds, or alternatively any other country abroad. In this case, the citizens lose responsibility for terrorist crimes European governments. Governments of countries worldwide in any case not encourage censorship of the media about the incident and duties as the situation with the same reference value of the real reasons for the founding of the United Nations reactions after World War II. All people must know a reall true ! In case, if anyone, in any way resist against these principles and rights according to international rights and political principles, then each opponent must be disposed of as a person who promotes the activity and stability of world terrorism. If any stand in relation to terrorist alliance will want to resist against legitimate political principles for using weapons or military attack, so in this case, all governments around the world has all the requirements for the use of weapons of mass destruction and commencement of liquidation European terrorist states. So King Peter Gottwald, in respect of their rights and legally formal situations, decide the task of each member of the International Law Intelligence Council, the registration court application to the courts of your governments and courts, governments around the world, as well as re-contacting the International Criminal Tribunal UN, UNGA group and the General Secretariat of the UN, for the possibility of establishing the international Tribunal for European condemnation of crimes of global terrorism and violation of the rights and principles of international conventions UNGA. So King Peter Gottwald, in respect of their rights and legally formal situation, therefore, calls on all governments to adopt such tenders and thus the foundation of our joint steps for the defense of our state and government, defense of civil rights and entitlements of international relations and on behalf States UNGA foundation international Tribunal for European condemnation of crimes of global terrorism and violation of the rights and principles of international conventions UNGA. So because of obligations under international law and Conventions, as well as the responsibility of governments to their own jurisdiction of the state and obligations to the declarations of a state office and the obligation to apply the principles of public services and offices for the legitimate function of the state, as well as my request in good interest for your country and your state, nation and civilization, today in the main event as my first effort to prevent global war. I thank you for your time and patience, patience is proof of your responsible relationship to politics, and your cooperation is proof of the good and important performances for the world and the future of all countries and world politics. I King Peter Gottwald and on behalf of the Federal Government Imperium of Diamonds' trying to implore all governments around the world, for your support for the adoption of the Imperium of Diamonds to UN member circuits and also the establishment of joint declarations on our joint diplomatic cooperation. I thank all the countries that support the development of world politics for a better future for all the peoples and governments of countries for better rights and freedoms diplomatic strength of our relationships to significant levels of world politics. Your courage and responsibility is indeed an important step for the future of the world. ID's because of the present situation of conflict in the criminal conduct and the State Government of the French Republic and ID's own demands to create extraterritorial colony temporarily, because of the principle of the UN Charter and ID's needed to ensure stability function ID civilization. So I ask you to confirm that right, by the president of such obligation an international by an obligation to respect the president pocketed relations. So in this case it can be exercised our cooperation and common development with the help of trade and a common strategy friendly development of our civilization. Justice as well as in relation to the obligation of the president to respect the international relations of France in the direction of membership in the UN, international conventions and UNGA. France may establish a joint agreement on the development of our civilization as ID's government, and the government of France by the form of bilateral relationship and in the interest of the common good and the peaceful use according to the principles of the UN Charter. Thus Safety must be ensured France government and stopping the act of collaboration and violations of international law or other exercise of terrorism and violations of the Constitution of the French Republic. .... Other Interests ID's in the dimension of the constitution of the French Republic will be discussed at a future time, in order to respect the principles of I ternational law and policy. We Love the World, Support and Develop. The One World ! E-mail and other communication is checked every day, the standard answer would come within 7 days. If you not received a response, please contact the nearest police department against terrorism and in the form of anti-hacker activity, or another International Political or Safety subject around the world. Organiser acquires the business parties, corporations and businesses at the state level, the foreign country and internationally, for the opportunity to ensure the growth of transnational relations business sides of the same category and thus their alliance to form a single entity activating the territory of the Imperium of Diamond's like a business Consortium at a unitary corporations representing General Council composed of many of the numerous range of business entities with legal personality. Organiser is organizing a group as the third representative of the Organizing documents such entities trading parties in the form of consortia which are composed of all acquired by business corporations, and thus create a common trade as an act collectively to expand its network of sales offices with a new name legal society over the legitimacy of the Organizing Document of the consortium and this authorization to use profits from its own program, trade and investment by the joint development of guarantee contracts between traders consortium. The consortium thus arises that three or more, and no limit on the number of parties business corporations the same size business category and merchants together constitute an agreement on trade cooperation as a consortium of ID's, and that means that the members of such an agreement becomes General Council as the main representation for body Consortium. The consortium is a fully independent body and its representation own dimension as the General Council functioning on the territory of jurisdiction of Diamond's Imperium, and thus no obligation dual taxation for persons from foreign countries. The consortium and its General Council are therefore legally recognized as the second person with his own foundation's headquarters under the jurisdiction of Diamond's Imperium, and not against a foreign state. Each consortium obtains legal address within the Imperium of Diamond Offshore's under the format of principle, while the right anonymous bank account of the State Imperium of Diamond's. Organiser therefore own position only as a contracting authority with a registry document and produce evidence common parties in order to form a consortium and the selection of the registration fee which will be handed over to the official authorities ID's government and to confirm the registry of a new business entity in the ID's Commercial Register, it means the ability to start a legitimate business activities in the Imperium of Diamond's and the extent of such jurisdiction. Organizer subsequently obtains financial share for its activity and gain a new member of the Group Consortium. For each consortium receives profits immediately in the event that the subject of the Consortium made a first payment of income taxes and profits. Profit from the creation of the consortium is ratified by the number for every single entity, while in the second ratification of a number of active business entities in the interest of capacities necessary for the full functioning of the consortium as a stable business entity, and therefore with acreage values ​​of the capitalist system ratification by market levels. Consortium may be founded in order to produce oil companies, firms and corporations with electronics, metallurgy, chemical industry, mechanical engineering, medical center or as agricultural centers and financial services, even the side of the bank from foreign countries together can launch function as a consortium of which there is one company form. Consortium may be established for the purpose of conducting business on behalf of another legal person status, and to the Strategic Trade Cooperation in the Imperium of Diamonds or the use of a new center for the export of the product abroad, mainly as a second source to ensure their own development resources to foreign parties. Advantage consortium for each business group, is the possibility of cooperation in a multi-national group and develop also thanks to intelligence and technological advancement from other individuals in the group and therefore is entitled to conveniently organize and develop as a group and with global selecting the best intelligence and values. Development is organized by the willingness of commercial parties in the interest of the provisions on deposit in contracting act of the General Council of the Consortium. Creating the Consortium on the territory of the Imperium of Diamond's is an opportunity to develop trade markets and build common commercial properties on the territory of the Imperium of Diamond's, under the name of the state Imperium of Diamond's and legal registry in the territory of international waters, as well as to free orbit and subsequently in free cosmic space and on other planets in the cosmos. This creates the ability to dynamicly developing at advanced level and significantly grow into the largest business groups in converting the entire world. Cooperation is beneficial for all traders and their interest in growth when using the multi-dimensional nature of global cooperation organized by the Common Market. Multy consortium becomes subject which comprises a further alliances between several different categories of Consortia which are tied together related business networks, meaning the structure of the system of Internal trade organizations to build their own modernization of all groups Multy Consortium for using common resources. Market development and financial cycle is composed of its own closed cyclisation without inflationary rhythm. The groups will jointly develop and produce advanced level of their own capabilities. Example activities and composition of the Consortium's multi-trade system when a corporation jointly formed a consortium single category of the market, such as consortia that may be composed of one business category, such as Metallurgy, is the second category Electronics, the third category Agriculture, and so on. Consortia are therefore then collectively unite to form a multi-consortium that it may be active as a group composed, for example, a business category markets for mining resources and their laboratory production, followed by the category manufacturing solid materials, machining category, categories of construction technology and product electrical engineering and thus the sales or the economic and strategic use of its own internal management of the consortia, or trade on the open market. This creates a multi-consortium. Multi-consortium may also focus on the public market, as is standard business corporation. Multy consortium is also based on a system of cooperation with the Government of Diamond's Imperium for planning grants and financial development objectives or division missions and projects, expanded categories multy national dimension. Trade body at the social company level, but the foundation office in the form of legal commercial entity. Business entity is intended only for small markets and easy to work voluntary nature. Junior business is a form of trafficking for children from 10 years, child's who is Freely interested. The body as a natural person presenting a certificate of proficiency in performance in the professional field, and thus the right to form a business as a contract company. Every natural person has the right to create an unlimited number of property firms owned by qualification and profession without reference to any other form of legal ownership of the name. The company is the physical association. Start Corporation is a business association that is designed for people who obtain certification for mental health condition and ability of professional development training is. Start founding corporation formed under the authority of an autonomous government Imperium of Diamond's why the owner of Start Corporation does not need any financial resources and expertise in the profession, while losing his own responsibility activities of the corporation. Start Corporation is a business-led management of the Government Office and the authorities organize the procurement of trade and development 'trade union. Corporate profits are determined to ensure the quality of life of the owner Start Corporation, and especially for his study or family development. In the period when the owner Start Corporation received sufficient education, the business association handed over to full management responsibility and ownership. If the owner fails to achieve the necessary qualifications, it will start Corporation passed in the name of another person in order, or will be made public outcry. Start Corporation is active at the public market, and particularly for cooperation with educational centers in order to provide practice for students during their education at the level of real business environment, and is a corporation or used for public purpose. The company provides for the registration of copyright and the arts of individuals and society by supporting the organization of business activities with the copyright value. The entity which is led by the retailers who are expanding strategy of the association on behalf of other clients entrusted corporations as owners of the business entity, or the Council Offshore Service Management team takes clients to the possibility of using the service team in order to create a new business entity. Association of firms and smaller merchants who together create a partnership agreement that arises from a commercial entity as a legitimate company in order to function according to the size category of rights trading company. The company belonging to another legal entity without a shared relationship, only destined for ceremonial matters. Television, radio, magazine, news and commercial act before a public audience. Trading company active in the digital world and the network business economics among others 3DD Real Estate companies. Virtual entity can possess anyone, without any limit while having the maximum number of other business entities. Company managing only the capitalist system-driven market and thus activate the self-development of commercial interests and strategic development under capitalist stragy. Investment company creates financial and development resources for other companies and corporations that use sponsorship in order to expand their own market and profit from investments to ensure the return borrowed for Investment companies. Ownership of the business Company, only one person, and with the established management team. Prime-Corporation Limited own capital limit. The association of two parties composed of persons as a financial investor and business organizer, thus to agree on a common profit. The association of two parties composed of persons as a financial investor and flexible business organizer, thus to agree on a common profit. Flexible organizer of trade is only temporary partner that can be exchanged for another candidate to Community if the candidate will possess a better business plan than its competitors. Trading company in order to develop transport logistics and establish cooperation as a supplier of goods under transit and either by private taxi service charges. The corporation focuses on construction markets, development of architecture and urbanization, and therefore the possibility of establishing a dual takings as its own center of the construction industry and activities of architect engineering and construction of the building. Construction Corporation consists of a number of professional experts and companies who jointly expand the building fund. Market processing and sales, management uses its own market when market activity of other traders and thus the creation of common own financial profit from the value added to the price of products and services. The use of logistics management of international markets for the possibility of interactive planning and expand contractual relationships with global traders to develop their own gain and the structure of markets. The government has the right support development of logistics management. Business association with the obligation upon the leadership level budgets to the limit dimension of owned capital to the level of maximum profits without limitation except for the obligation to respect tax systems. Joint-stock Corporation issued and limits their own investment securities available for sale are the foundation of their prices by size of economic power joint stock corporation. State organizes business in order to build new markets and business, raw, resource and financial networks civilization. Company commercial interest only active on the territory of the Federation, or between Company bodies and by expanding own multi infrastructure throughout the civilization. The company has a widespread development rights at official level synchronization. The association of a consortium of one category of the retail market and thus functions as a business company. Association of Corporate different business categories and the creation of business cooperation such as jointly owned other person associated corporations made up for the purpose of activities as a single business entity based on the form of the Business Council dealer associations. Association of consortia to function as one company. The company with the register of trade associations that own the debt level of confidence of the financial crisis and bankruptcy, and there are obligations of the act entrusting the indebted business entity into the hands Management Company that extends the strategy of the foundation property uses many of the numerous dimensions of a registry operated business associations which are therefore in the hands of management administration form internal and public business strategy of common interest for the financial management and development of business entities with a view to ensuring their deleveraging and returning back into the hands of the legal owner. Indebted corporations that are responsible of its trade name. Group of companies based on a system that allows immediate own immediate ability restructuralization markets and internal resources in accordance with the strategic plan and emergency situations civilization and business markets. Corporations own source benefits and the right to activate multiple forms multy trade, as well as an interactive cooperation with Federal Bank. Publicly anonymous business entity is a form of private association which is associated with the business of government, and receives orders from the authorities of the states. Military orders, arms manufacturing, technology, special resources, others. Corporations that contacts with other governmental and foreign merchants or services, and always with a view to selling the business intelligence development plans and building intelligence used to grow new projects in the rhythm of state business stability and also to develop new markets or increase their dynamics. Trading company with its own jurisdiction in the form of a free trade categorization of activities in the space reserved for a limited period of time and with limited territorial zone. The register is kept at the offices of the government. Corporations with form their own principles of jurisdiction and activity for the purpose of self-interest according to the contractual provisions with the government of the country. Trading company that supports government and local authorities, with their own financial profit from operations in the fees for use of authority and the establishment of commercial and professional intelligence networks or Multi sponsorship, development and consumerism. The Office carries out political activity in public affairs, and it is necessary to respect the obligation of the company structure in sync with the authorities, police and investigative bodies governed by public action. Form institution and business entity uses its own business entity management used for the commercial application of research and securing sources of finance. Corporation active in the size of the planet and as a business entity expanding its own infrastructure company. Corporation active in the dimension of space stations and expanding as business entity owns the infrastructure company. Multy business entity with its own infrastructure cosmic sources and industrial centers between planets in the universe. Research center with free opportunities to own and expand their own resources to develop the infrastructure at the research center and to research work around the space subjects special natural phenomenon. Diet merchants in common centralization of business rhythm in the same direction, thereby resulting Mercantile Exchange as traders parliament in order to increase the centralization of market intelligence and enable a steady income logistics business development. Exchange is led by the founder, or representations that have been selected from a number of traders active on the exchange. Stock representations loses other rights of ownership and management of any other business entity. Exchange may collect fees for the financial register of cooperation and business development rhythms or register a trade with investment materials. The Exchange is a legal institution. Your Primary option for Business Start ? Corporation in Legal possession of Register people, and under management supervisory of Manager Council's of Imperium of Diamond's and Manager's Legal responsibility. People in registration have profit from Corporate business activity, and duties for their own education in profession until time, when owner of corporation have certification for his intellectuality and responsibility for managing corporation. ID Corporation's Start, open to everyone around the world, the goal is to stabilize markets and civilization of the country's ID, and the growth of the body corporatocracy. Today, because of terrorism on the part of European governments, each Applicant has own entitlement to apply for a judicial procedure which means the right for full financial compensation for blockages to develop. The situation in Europe, the influx of immigrants and migrants, each of which owns all rights to know such opportunities for their own development, and that because the federal government Imperium of Diamonds opens right of citizenship to all people around the world. Please certified Your register in Notari or Lawyer Quartier, and with Your own description of Your interest for business activities.